(Scarlet O'Hara Hardy Gloxinia) This plant's long, tubular, deep pink flowers dangle from apple green, leaf-like calyxes. Fuzzy red petioles connect the flowers to deep red stems rising above slightly furry, soft green leaves. This older hybrid of South American gloxinias can handle a bit of winter chill. (Scarlet O'Hara Hardy Gloxinia) This plant's long, tubular, creamy pink flowers dangle from apple-green, leaf-like calyxes. Fuzzy red petioles connect the flowers to deep red stems rising above rich green foliage. This older hybrid of two South American species can handle a bit of winter chill. Hummingbirds enjoy gloxinias. 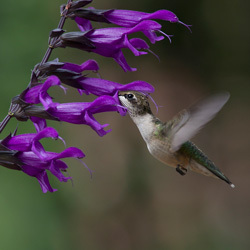 By planting Hardy Gloxinia and other hummingbird favorites in a setting devised for close-up observation, you have a front-row seat for hummer antics during the growing season. It's a fine choice for a patio planter or rock garden. The flower tubes of gloxinias are referred to as having fused petals. Some, such as the white-flowered, hybrid parent Sinningia incarnata, are barrel-shaped similar to a cigar-style Cuphea. Others, such as the red-flowered species S. tubiflora, have lacy corollas at their openings. Similar to most Sinningias, Scarlet O' Hara's roots are tuberous. The elliptical, veined leaves are also interesting due to being smooth with a slightly pitted texture and having fine eyelash hairs on their edges. This is a petite perennial that prefers rich, well-drained soil and locations with full sun to partial shade. As part of the Sinningia genus, it's a member of the Gesneriad family (Gesneriaceae), which is probably best known for African Violets (Saintpaulia genus). Sinningias are named for Willhelm Sinning (1792-1874) who was a gardener at Germany's University of Bonn Botanical Garden. Sinning co-authored the 1825 book A Collection of Beautiful Flowering Plants, which contained one of the first botanical illustrations of a gloxinia. I have enjoyed this plant for several years. The hummingbirds just love it. I grow it in a container on my sunny deck, where we can sit and watch as the hummers go from flower to flower. It is in bloom constantly from early June through frost. I stake it. It gets better every year as the tuber enlarges and the plant sends up more stems. In my NH garden, it needs to come in before frost. I cut it down, then put the pot in a cool spot in the basement (about 45-50 degrees), and it stays dormant until I bring it out in about late March and give it light and some water. It quickly grows and flowers. At that point, the more light the better, to keep the stems strong and thick. This is one of my favorite hummer plants! Plants were healthy, packaged very well and shipped on time. Fantastic selection of Salvias that promises to keep growing. Will continue to order from your site. Plants arrived well pack and in good health. I would order again from this company and would also recommend them. 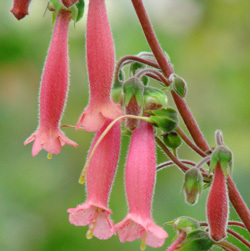 I must say my order of Scarlet Spires salvia arrived as the most beautiful plants I have ever purchased to receive through the mail. Absolutely awesome quality!